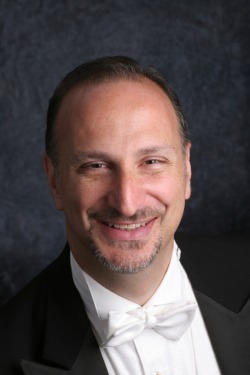 Frank Albinder became the Music Director of Woodley Ensemble in 2000. He came to Washington, DC from the internationally renowned male vocal ensemble Chanticleer, where he most recently served as the group’s Associate Conductor in addition to singing with the ensemble. During his 11-year tenure with the group, Mr. Albinder performed in all 50 states and in 20 foreign countries. He appears on 20 of the ensemble’s recordings, including Wondrous Love, which was recorded under his direction, and the Grammy® Award-winning Colors of Love, for which he designed the concept and chose the repertoire. Other performance credits include the Boston Camerata, the Robert Shaw Festival Singers, the Washington Bach Consort, and the Concord Ensemble. He holds a B.A. in Vocal Performance from Pomona College and two M.M. degrees (Choral Conducting and Vocal Performance) from the New England Conservatory of Music. Between 1984 and 1988, Mr. Albinder was Director of Choral Activities at Davidson College in Davidson, North Carolina. He is the American Choral Directors Association's National Chair of Repertoire and Standards for Male Choirs, President of Intercollegiate Men’s Choruses, a national board member of the National Collegiate Choral Organization, Vice-President of ChoralNet, the internet's principal portal for information and resources relating to the choral field, and President of the Pomona College Alumni Association. He is also the Music Director of the Washington Men’s Camerata and conductor of the Virginia Glee Club, the men’s chorus at the University of Virginia in Charlottesville.